I'll say at the outset that I enjoyed reading this book. 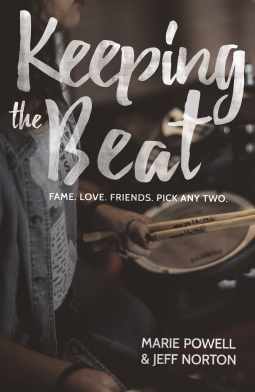 I'm a little confused by the authorship and tagline, so I want to be clear that I still give Keeping the Beat a thumbs up before I get into petty issues. So...the authorship. This seems to be a re-publish or an American publishing of the 2013 Drummer Girl, ostensibly solo authored by screenwriter Bridget Tyler. Marie Powell's bio identifies her as a pen identity of an "entertainment veteran." The info page on my ebook download has the authors as "Bridget Powell, Jeff Norton." Comma? The cover has an ampersand, but it's hard to get a read on whether Powell/Tyler and Norton are for-real writing partners or how this book came to be listed under both their names. They don't thank each other in the acknowledgments, and they both give the impression it's their book. The book starts out with a murder reveal, but despite what some of the marketing says, it's not a mystery. I mean, we don't know whodunnit as the story unfolds, but the rest of the novel is told in time, before the dead girl is found in the pool. It's a weird conceit, honestly. If you skip the bookends and concentrate on the girl-band and friendship dynamics, you'll be a lot happier. Though even in that realm, the book is a bit misleading. "Fame. Love. Friends. Pick any two." is overselling the conflict. None of the musicians is really after fame. Love and friends, for sure. The cover also makes the book seem darker than it is. The band is called Crush and takes place in a reality TV mansion in LA, for dog's sake. Not so dark. Also, disappointingly light on the reality TV details. Still, I told you I enjoyed reading this novel, and I did. I even liked the copyright page, which credits the book and covers' designers, Kate Egan and Kate Hargreaves, respectively. I want Crush to be more what you'd get if Katy Perry had a baby with The Clash and then let Madonna circa 1989 raise it. Clever, right? These girls, except for the one who ends up dead, are Brits, so much of the dialog is smarter than you find in American novels. Much, but not all. The accent isn't consistent throughout. That's another reason I wish I knew what the deal was with the authors' collaboration. btw it's unclear to me whether Lucy might be a person of color. There's lots of talk of her curls. The only identified POC are a Mexican-American gardener and Lucy's wise music mentor, with "dark chocolate skin." Am I talking myself out of liking this book?! ?